Past recipients of the Walter Camp Distinguished American honor include nationally-respected sportscasters Pat Summerall (2004) and Keith Jackson (1995), all-purpose television personality Regis Philbin (2003), former NFL Commissioner Paul Tagliabue (1994), world-renowned entertainer Bob Hope (1985), former college coach Eddie Robinson (1982) and last year’s recipient, former Nebraska coach and athletic director Tom Osborne. Born and raised in South River, N.J., Theismann was a three-sport standout at South River High School. He attended the University of Notre Dame. As a three-year starting quarterback, Theismann led the Fighting Irish to a 20-3-2 record and threw for 4,411 yards and 31 touchdowns. 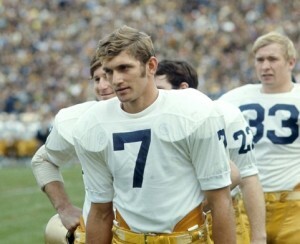 He led Notre Dame to two Cotton Bowl appearances and his 4,411 passing yards rank fifth in school history. His 526 passing yards against USC remains a school single-game record. He was selected in the fourth round of the 1971 NFL Draft by the Miami Dolphins and in the 39th round of the Major League Baseball Draft by the Minnesota Twins. He elected to sign with the Toronto Argonauts in the Canadian Football League and played three seasons and earned All-Star honors twice. In 1974, the Washington Redskins obtained his rights and by 1978 Theismann became the team’s starting quarterback. In 1982, he led the Redskins to Super Bowl XVII where they defeated the Miami Dolphins, 27-17. The following year, the Redskins made it to the Super Bowl again as Theismann earned the league’s Most Valuable Player award. A two-time All-Pro honoree and Pro Bowl selection, Theismann played 12 years in the NFL, including 163 consecutive games and holds Redskins’ records for passing yardage (25,206), completions (2,044) and attempts (3,602). His playing career came to an unfortunate ending in 1985 after a badly broken leg during a game versus the New York Giants. Off the field, Theismann earned the NFL Man of the Year award in 1982 for his community service and dedication to the health and welfare of children. He was induced into the New Jersey Interscholastic Athletic Association Hall of Fame (1997) and College Football Hall of Fame (2003). Theismann has been a football broadcaster and analyst for ESPN, NBC, and currently, the NFL Network. He is a sought-after motivational speaker and also owns a restaurant in the Washington DC area. Theismann, as well as other major award winners, and members of the 2013 Walter Camp All-America team, will be honored at the organization’s 47th annual national awards banquet on Saturday, January 11, 2014 at the Yale University Commons in New Haven.